Nikon recently sent out a survey to existing product owners. 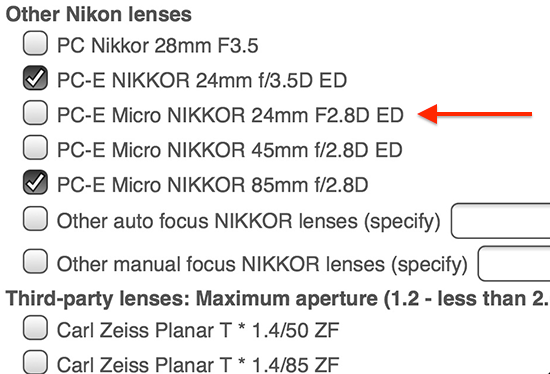 One of the questions about current lens ownership included also a listing for a Nikkor PC-E Micro 24mm f/2.8 ED lens. Nikon currently has three perspective control lenses and 24mm f/2.8 is not one of them: PC-E 24mm f/3.5D ED, PC-E Micro 45mm f/2.8D ED and PC-E Micro 85mm f/2.8D. The question remains: typo or a leak? A 24mm Micro lens doesn't make much sense, but you never know - VR on a wide angle zoom was also strange until the 16-35mm f/4 was announced. Maybe Nikon wants to up the game after Samyang announced their T-S 24mm f/3.5 lens. This entry was posted in Nikon Lenses and tagged Nikkor PC-E Micro 24mm f/2.8 lens. Bookmark the permalink. Trackbacks are closed, but you can post a comment.